Sitting next to Interstate 5, it’s hard to miss it, with its miniature golf castle (which my daughters point and call the ‘princess castle every time we pass’), batting cages, go-cart race track and a rock climbing wall you can see from the highway. Outdoor attractions also include bumper boats, which have squirt guns in the warmer months and the “Sky Trail” which is a ropes course where guests are harnessed in and enjoy a high-flying obstacle course. The mix of attractions, activities and food is an ingenious mix to cater to not only families, but also the Oregon weather, where in Spring it can snow one weekend and be nearly 70-degrees the next. Harmon said a family could spend an entire day at the park, where several hours could be spent at the nearly dozen indoor and outdoor attractions. Inside attractions also include the “Lazerxtreme,” a virtual reality laser tag game, “Max Flight Cyber Coaster” an indoor roller coaster simulator and my personal favorite the “Frog Hopper” which bounces kids and adults alike up and down. Of course the arcade also features games where players can earn tickets for shooting basketballs or other games of skill to get prizes at the end of their visit like a Play Station or an iPod. The facility is so popular that it is a regular on the list of Oregon’s top 10 tourist attractions and it is independently owned, with two other Family Fun Centers in the Seattle area. Harmon both quick-stop visitors and people who make the park a destination enjoy his business and that he is always looking for new activities and games to add to the mix. The one thing many families would ask at this point, is how do the prices compare with other fun center businesses like Disneyland. Harmon says a family could spend as little as $5 per person up to $33 for a full-day all-access pass. The fun center can also host birthday parties, company events and holds fundraisers for local charities to help in the community. About Family Fun Center and Bullwinkle’s Restaurant (from www.fun-center.com): Family Fun Centers (FFC) were started over 50 years ago in a small rural town by twin brothers Jim and John Huish in college. Through hard work and dedication, FFC has developed into a growing and successful business. Great pride is taken by FFC to create an atmosphere that is both family-oriented and professional. FFC are located throughout the Northwest with locations in Wilsonville, Oregon and Tukwila, Washington. Bullwinkle’s Family Food ‘n Food Restaurant is part of Family Fun Centers. In April of 1991, FFC negotiated with Bullwinkle’s Incorporated, our then franchiser, and purchased their assets. Bullwinkle’s unique talents made him the perfect candidate to add an exciting dimension to the restaurant-entertainment industry. Bullwinkle’s exceptional multi-level humor has given this cartoon character the rare affection of both children and adults. Wilsonville, Oregon was opened in December of 1994. What to bring: Your sense of adventure and the willingness to have some fun. I, personally, bring my Babe Ruth attitude as I stand in the batting cages and relieve some stress. Tip: Harmon said that if you plan on spending any time at the Family Fun Center, make sure to go with the all-day pass. For $33 it allows you to ride the rides as many times as you like all day long. In addition, the food at the fun center is very good, so having lunch there isn’t going to by carnival food by any stretch. The food includes everything from pizza to burgers, sandwiches and even salads. Yes, they have salads. They also offer ice cream – hey kids need that sugar high if they are going to take on a ropes course or shoot each other with squirt guns – and prizes are reasonable. 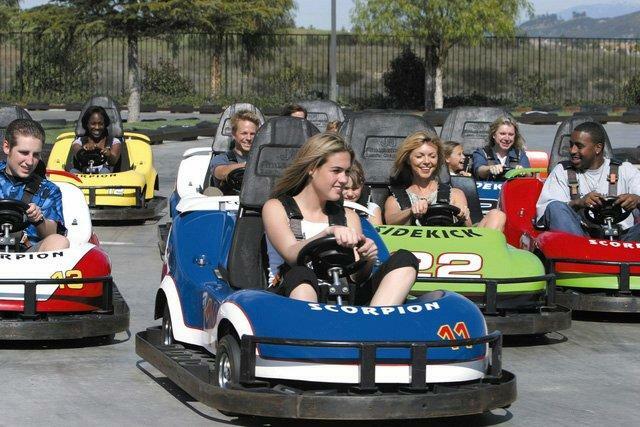 In addition, visiting the Family Fun Center website at www.fun-center.com can also show you what specials are going on. For example regularly during Spring Break they will offer discounted prices or deals. Season: The fun center is open year-round, however Spring through late summer is the best time to visit as the outdoor activities are more comfortable. Getting there: The fun center is located along Interstate 5 in Wilsonville at the Wilsonville Road exit. The address is 29111 SW Town Center Loop West, Wilsonville, Oregon. Exit 283 off I-5 Freeway and take exit 283 off I-5 and go east. Turn left onto Town Center Loop W. Proceed along Town Center Loop until you see the Family Fun Center on the left hand side of road, just past Les Schwab Tires. For directions from your address, visit their website at www.fun-center.com.